Turn old vinyl records into beautiful wall art. 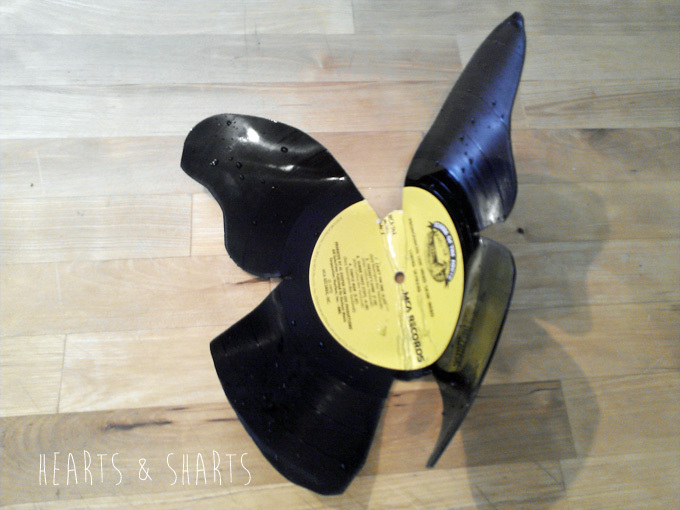 An easy DIY craft tutorial idea to upcycle a vinyl record into home decor. Yo. Dena from Hearts & Sharts here, super excited to be doing a guest post for The Crafty Blog Stalker! I’m from the great state of Texas but recently moved to Georgia with the hubs. I’m lucky enough to be a housewife and spend my days running back and forth from the kitchen to the laundry room to the craft room, stopping occasionally to love on my fat, stinky basset hound. First, grab a record. Every time I get into a record related project, I always Google the value of the record on eBay. Well, except for that one time, when I melted this Lynyrd Skynyrd album. Oh well, it made a sweet butterfly. Next, turn on your broiler and draw your butterfly on the record using chalk or a marker. I printed out some butterflies, cut them out and then traced around them. I found that the chalk didn’t come off so well after the fact, but I just made that the backside of the butterfly. Lay your record on a foil-lined baking sheet and pop it under the broiler. These melt pretty fast. I left the oven door open a tad so I could keep an eye on it. Once it starts to get soft, pull it out of the oven and cut along the chalk line using scissors. Don’t forget to put on some gloves first! Chances are, the record will cool off before you get the whole thing cut out, just pop it back in the oven for a bit and then continue cutting. I had to repeat this process three or four times before I got it all cut-out. Since this has to happen so quickly, it’s hard to take pictures and cut the vinyl while it’s hot. Once the butterfly is cut out, pop it back in the oven one more time to get it soft enough to shape the wings so that it looks like it’s flying… er, fluttering, whatever butterflies do. Once you get it where you want it, you can run it under some cool water to get it to harden up faster, or just hold it in place until it has cooled. That’s it. So simple. And when you’re done, you just stick a push-pin in the hole to hang it on your wall. If you aren’t into the record look, you can spray paint it. This would make some great wall decor for a little girls room; a flock of white butterflies on a painted wall would look magical! If you want to check out another vinyl record project, you can hop over to Hearts & Sharts and check out my new mail holder as well as how to create some awesome chalkboard art like the one above. 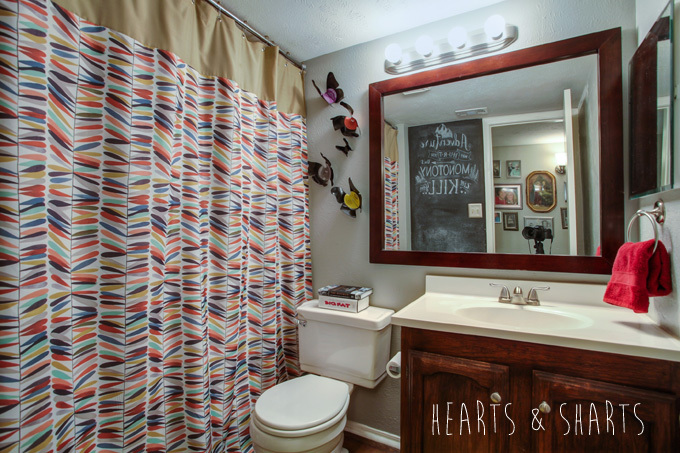 Do you have a favorite upcycled home decor piece in your home? Share and leave a comment below! 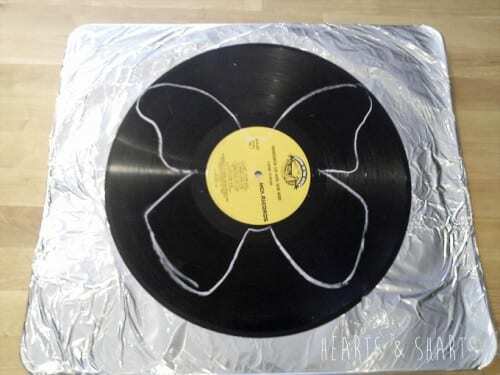 SAVE HOW TO MAKE VINYL RECORD BUTTERFLIES TO YOUR FAVORITE PINTEREST BOARD! Super cute, ! I love butterflies and those are unique.Thanks for sharing tutorial! These are so cute and cool! I didn’t think you could do things like this at home. Holy cats! Love love love!! These would go perfectly outside in our garden! Thanks for sharing Hearts and Sharts! I make bowls from old records. They melt fast! Love your butterflies. those are super neat and unique! I LOVE this project! I have a thing for records, and even have an upcoming record project planned, but I’ve NEVER thought to use them like this! Thanks Katie. Going to give this ago in the summer when I feel crafty the most. Kind of cool, though I hope people are only using scratched up records or Justin Bieber albums for this. It hurts my heart to think of someone cutting up a valuable usable vinyl record!